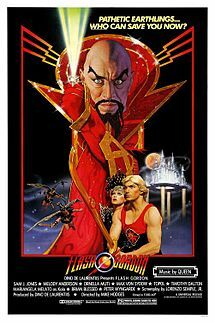 I remember seeing Flash Gordon all the time on HBO when I was a kid, because they must’ve paid an ungodly sum for the rights and were determined to get it’s moneys worth, even if that meant cramming what I knew even then was a terrible movie down subscribers throats. Still, despite being ever-present in my youth, I easily haven’t seen it in 25 years or more, and it might’ve been another 25 before the urge struck me to see it again if the movie Ted hadn’t made me long to rediscover it. Well, maybe not long, but curious. After all, even though I didn’t like it as a kid I’m also aware that age and maturity and shifting perspective changes peoples attitudes of and there was always the possibility that coming to it relatively fresh after all these years, with no real memory of it beyond it being terrible, might find it improved. Like a fine wine. Have integrity in everything you do, no matter how inconsequential it may be, because if you don’t have integrity, then what do you have? Even that which is unpalatable can be make palatable through proper preparation, whether that be octopus or anything else. 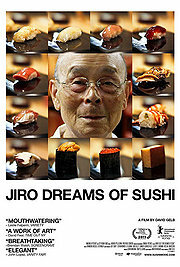 A truly fascinating film. Thanks to Netflix for recommending it to me. 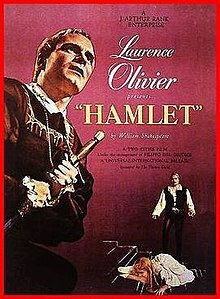 When you look at the credits listed above for this version of Hamlet, you’ll see I included no mention of any actors other than Olivier that might have been in the film, nor any other technicians or behind-the-scenes people at all. This was not an oversight on my part, but was by design. Yes, it is true that Hamlet requires a great many people to fill the roles, and yes, making a movie requires a greater number of people, working in concert, to get it made. But though the film and story need more bodies to make it happen, the fact is that really, this movie is Olivier’s baby. He acted the part in the theater, he adapted the play for the screen, he produced the film, directed it and starred in it. Rightfully, he wins the plaudits for it, such as being listed as the sole creative force on the film for the purposes of this post. And when there is criticism to be had – some of which you can see here – he takes the brunt of that, as well. If Hitchcock/Truffaut is the gold standard of the penetrating director-on-director interview book — think of the brain-trust there, with the man who made the absolutely perfect Jules et Jim picking the brain of the man who made the absolutely perfect Psycho — then This Is Orson Welles is clearly the silver standard. At all times throughout the book Orson Welles seems intent on dispelling all myths about him and come across as just a humble guy struggling along in the service of his art and for the most part it works. And even though he became a punch line for appearing in wine commercials later in life, there’s something truly endearing about a man who was willing to use every last dollar he had to make his own films and didn’t care where he got the dollars from and the dreck he had to appear in to get it. If nothing else, you have to respect his dedication.